As a mother of four in Jamaica Plain, Peg Scanlan didn’t always have a lot of resources at hand, so she’d get creative. One summer day, she wanted to give her young kids some relief from the heat, but her landlord wouldn’t allow tenants’ children to play in the yard on Jamaica Street. So she and her longtime friend DeeDee got a kiddie pool, filled it with water, and let their kids splash around – in a bedroom on the top floor of a triple-decker. “They thought they could get rid of it before my father got home,” her youngest son, Tom, recalled. “They thought they could dump it out in the tub, but they didn’t realize how heavy the water was.” Her sister, Nancy, said, “I had to help bail it out.” When Peg’s husband, Bill, arrived home from work, he was concerned the floor would collapse. “What did you do?” he asked. (It’s a question he would repeat many times over the years.) The story remains a favorite among their now grown children – and provides a glimpse into Peg’s approach to parenting, and life. Margaret A. (Myers) Scanlan died Wednesday, April 3, after a long battle with ovarian cancer, at age 80. She was surrounded by her family at home in Walpole. Bill was also born in Boston, on April 28, 1938 – one day after his future bride. He likes to joke, “I married an older woman.” Peg’s response varied, often an eye roll followed by the declaration, “Isn’t he cute.” This past summer, they celebrated their 60th wedding anniversary at a party lovingly put together by many of their grandchildren and their daughter-in-law Teri. They moved from Jamaica Plain in 1970 to Needham. Peg’s mother had died, so her father and sister moved with them to the suburbs. Since 1984, they have resided in Walpole. Loved ones never worried about going hungry at Nana Peg’s. If she knew you were visiting, she would make sure to have your favorite food ready. For surprise visitors, she usually had goodies stashed, sometimes in the kitchen cabinets or the stove. (It’s a trait she would hand down to her two sons, who have both been caught with hidden stockpiles of their favorite sweets.) Her youngest granddaughter, Kathy, recalls snacking on brownies and talking for hours at Nana’s kitchen table. “It was a staple,” Kathy said. “Nana got me into crosswords and word jumbles,” her oldest grandson, Kyle, said, remembering how she would sit with him at the dining table and show him how to tackle word puzzles. Halloween was Peg’s favorite time of year, her daughter Cheryl recalled. “I remember one year she dressed as the Easter Bunny. She wore blue-plaid feety pajamas and had a big cotton ball on her behind for a tail; DeeDee was dressed as a country doctor,” Cheryl said. “They went to visit my father at work at the airport (Logan). When they found him, he was with his boss.” In later years, she would trick-or-treat at her grandchildren’s houses with whoever she could recruit to don a costume and drive her around since she didn’t drive. One year, she dressed as a pirate and wanted a single hoop earring to complete the look, but she didn’t have pierced ears or earrings. Instead, she grabbed one of the plastic rings holding her shower curtain, clipped it to her earlobe, and then headed out. 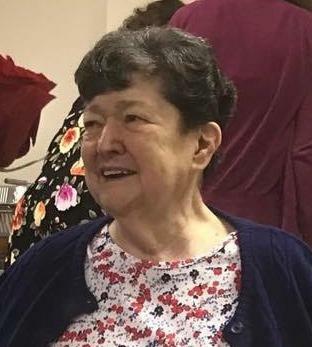 In addition to her husband and sister, Peg leaves her four children and their spouses: William Scanlan III and his wife, Linda; Cheryl McDonough, wife of the late James J. McDonough; Kathleen M. Scanlan; and Thomas Scanlan Sr. and his wife, Teri. She also leaves her two nieces, Stacey Myers and Danielle Beal, and her husband, Dave. Ten grandchildren: Heather Adamski and her husband, Marc; Kyle McDonough; Thomas Scanlan Jr. and his wife, Kelsey; Sarah Anderson and her husband, Trevor; Kevin McDonough; Patricia Smith and her husband, Shawn; Andrew Scanlan and his wife, Jessica; and Kathleen, Daniel, and William Scanlan. Plus, seven great-granddaughters, Lily, Charlotte, Emma, Hayden, Brinley, Isabel, and Vera, and two great-nieces, Julia and Jillian Beal. A Mass of Christian burial will be celebrated Tuesday at 10 a.m. at Blessed Sacrament Church, 10 Diamond St., Walpole. Interment at Knollwood Memorial Park, Canton. For directions and guest book please visit thomasfuneralhomes.com. In lieu of flowers, donations can be made to The Jimmy Fund at Dana-Farber Cancer Institute or the Lank Cancer Center at Beth-Israel Deaconess Hospital-Needham.